Wedding Cupcakes, a photo by CAKE Amsterdam - Cakes by ZOBOT on Flickr. 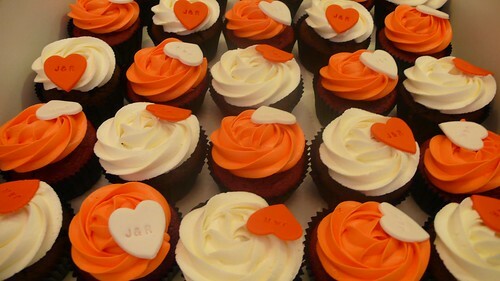 Orange, Black and White decked wedding party with matching cupcakes! FLAVORS : Chocolate cupcakes with white vanilla buttercream frosting and Red Velvet cupcakes with Orange cream cheese frosting! Orange wand White hearts with stamped text : "J&R"